Port Ludlow is a resort community in Jefferson County. With a population of 1,968 at the 2000 census this community is the host to multiple resorts and planned communities attracting more affluent residents who were retired, buying vacation homes, or needing a more convenient commute to the business centers on the east side of Puget Sound. Based on per capita income, Port Ludlow ranks the highest rank achieved in Jefferson County, and 16th of 522 ranked areas in the state of Washington. Port Ludlow’s location and marina facilities make it a convenient and popular port for leisure craft sailing between Puget Sound and the San Juan Islands. The history of the port started during an expedition led by Charles Wilkes, now the name of an elementary school on Bainbridge Island, when he entered the Puget Sound in 1841. 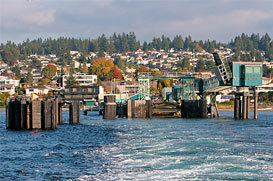 He named the bay “Port Ludlow” after the Naval Hero of the war of 1812 named Augustus C Ludlow. The inlet, often named Ports during the 1800’s wound up becoming hugging logging and mill community based on the claims of Thorndike and Sayward who produced over 3,000 feet of lumber daily. The mill that wound up logging the timber around the bay, and then later logging the surrounding areas via oxen and horse, was leased to Amos & Phinney Company in 1858. When the Hood Canal bridge was constructed in 1960 Port Ludlow became a resort community with more direct access to the services of Kitsap county as well as Seattle. The bridge also opened up the opportunity for military members and there family’s to consider the area as a to reside and still be able to commute to the bases in Kitsap county. It is about a 20 to 30 minute drive to Bangor Sub Base and Bremerton is about 50 minutes away. Even though the Hood Canal bridge is the largest floating span on salt water it still does not have a toll. Port Ludlow is very rural despite the development and the natural beauties of the northwest are only steps from your door. Wildlife is abundant in the area; Deer are spotted frequently. Otters can be seen frolicking in the bay. Port Ludlow maintains an interpretive trail system around Ludlow Bay and to Ludlow Falls one of the most beautiful local attractions, an active Salmon stream and in season, visitors can watch as Salmon ?ght their way upstream to begin a new generation.